CENTRE FOR EXCELLENCE OFFERS HIGH ACHIEVING STUDENTS A CHOICE OF FOUR ACCELERATED PATHWAYS FROM YEAR 10 TO YEAR 12 LEADING TO THE HIGHEST ATAR TERTIARY EDUCATION COURSES. TERRITORY BORN OSCAR FERDINANDS IS AIMING HIGH. OSCAR HAS HIS EYES FIRMLY SET ON ACHIEVING HIS NT CERTIFICATE OF EDUCATION WITH AN ATAR OF 90+ AT CASUARINA SENIOR COLLEGE IN THE CENTRE FOR EXCELLENCE PROGRAMS. Oscar has made it to the U14 tennis national quarter finals (eighth best in Australia) and went to South Africa in 2010 as part of the team for Australia’s bid to host the Soccer World Cup. As an NT Institute of Sport junior tennis player, balance and a calm focus is what enables Oscar to stay on the ball when juggling the highest academic subjects, competing at a national level in tennis and spending time with his mates. Oscar is in all Centre for Excellence and ACE programs at Casuarina Senior College. His academic acceleration will see him complete four Stage1 subjects in Year 10 and have the opportunity to commence Stage 2 Biology and Stage 2 Physical Education in Year 11. As a triplet Zoe Jaenke is one outstanding 16 year old. Zoe, a student in the Centre for Excellence Elite Sports Program (ESP) at Casuarina Senior College, comes from a family of BMX riders competing at an Australian level. In 2015, Zoe ranked fifth in her age group. Zoe loves the performing arts, arguing the fact and persuasive writing. Opportunity resonates with Year 11 student Zoe in all areas of her life. Zoe’s weekly workload is impressive, completing Stage 1 (Year 11) and a Certificate III in Fitness, fulfilling Year 11 College Captain duties, NT Music School rehearsals, Gold Dukes, BMX training and competitions, umpiring netball, part time work and writing a short stories in her spare time. As a Sanderson Middle School student in 2014, it was Zoe’s desire for opportunity that led her to enrol at Casuarina Senior College. “My parents said it was a good school, with good music and dance programs. I was thinking of being a music or performing arts teacher or physio. 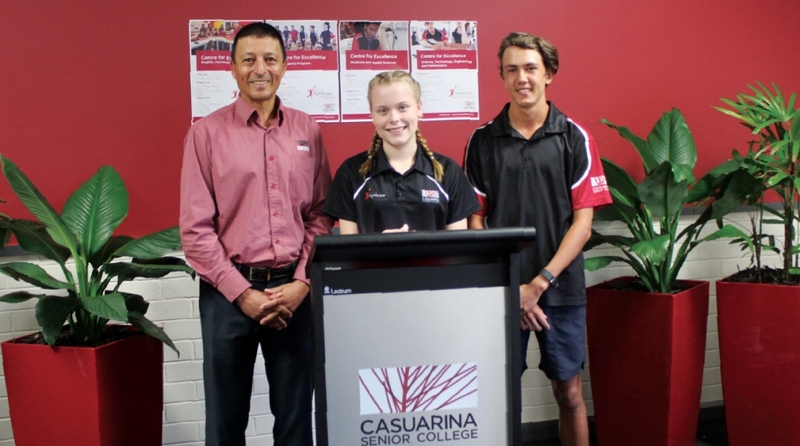 When I looked at Casuarina Senior College online there were so many opportunities” says Zoe. As an inaugural Elite Sport Program student athlete, Zoe says “I was so excited at the opportunity to be accepted into the Elite Sport Program. I am on track to successfully complete Cert III in Fitness and go to Cert IV next year to complete my NTCET with an ATAR and as a qualified personal trainer, which is amazing”. “I feel very fortunate to have so many opportunities created by my parents, the College and my caring teachers” says Zoe. For more information, testing dates or to enrol visit www.casuarinaseniorcollege.com.au or call 08 8983 7300.